The Ghomara Berbers are one of many groups of Berbers. The Berbers are a North African people group who were conquered by Muslim invaders in the seventh century. The name Berber, which is derived from the Latin word "barbarian," was given to them by the Romans in the third century A.D. Today, the term 'Berber' refers to any native speaker of one of the Berber languages. There are three main subgroups of Berbers in Morocco, each containing several smaller tribes. The Ghomara is one of the smallest tribes. They live in the Moroccan Rif, in the northeastern region of the country, north of the town of Fez, near the Mediterranean coast. Today, most Berbers refer to themselves as the Imazighen, which means "men of noble origin." 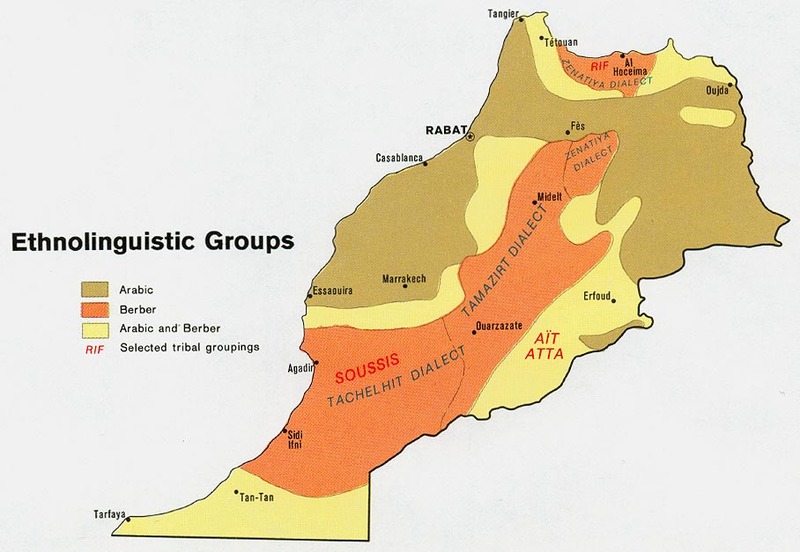 Berbers are generally bilingual, speaking both their Berber dialect and Arabic. 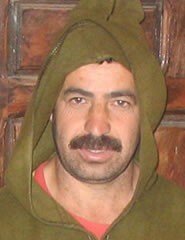 The Ghomara Berber speak a unique dialect known as Ghomara. Berbers can be found in all three regions of Morocco: the Northern Rif (hilly region), the Middle and Central High Atlas Mountains, and the Western High Atlas Mountains. 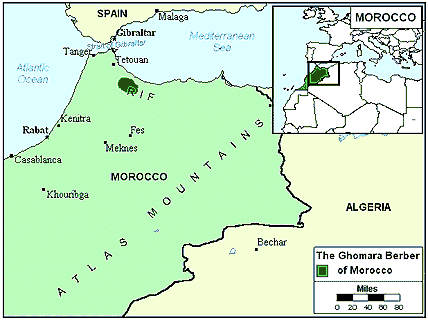 Due to their location in the Rif, the Ghomara Berbers are farmers. They produce and consume large amounts of barley, corn, millet, wheat, and rye. In areas where water is plentiful, vegetables such as tomatoes, onions, squash, peppers, and potatoes are grown. Chickens, goats, and sheep are also raised. This supplemental food source provides milk, eggs, butter, and meat. Although the number of cities is increasing in the Rif area, many of the Berbers still live in homes made of mud brick and stone. Mountain village homes are quite similar. They are usually flat-roofed houses made of stone that has been reinforced with dried mud. Berber dress is very similar to that of the Arabian community. The men wear the traditional djellaba cloak, which is made of cotton with wide sleeves and a hood. They also wear cotton turbans or caps. The men work in the fields, herd the animals, and hunt, while the women do the housework and care for the children. The women only help the men in the fields during harvest time, when they take the newly cut grain to the threshing floor. For the Berber, life revolves around important ceremonies such as births, marriages, and deaths. Many rites of passage are important parts of their culture as well, such as the first haircut and circumcision for boys. The most elaborate of all is the marriage ceremony. The Ghomara, like other Berbers, live in a society that is male-dominated. The line of descent is traced through the fathers and all inheritances are passed down through the males. Also, as a means of preserving themselves as a people, the Ghomara are not permitted to marry outside of their own group. The Ghomara, like other Berbers, are virtually all Muslims. In particular, they belong to the Malikite branch of Islam. The Islamic religion is based on the teachings of Mohammed. The Koran ("holy book" of Islam) was supposedly given to Mohammed by the angel Gabriel. Islam is a religion of works that is based on five "pillars": (1) A Muslim must affirm that "there is no god but Allah and Mohammed is his prophet." (2) Five times a day he must pray while facing Mecca. (3) He must generously give alms. (4) He must fast during Ramadan, the ninth month of the Muslim year. (5) He must try to make one pilgrimage to Mecca in his lifetime. A profession of faith in Jesus Christ can cost a Muslim his life. This explains why there are so few known Ghomara believers in Morocco. * Pray that the Lord will call people who are willing to go to Morocco and share Christ with the Ghomara Berber. * Ask God to strengthen, encourage, and protect the small number of Ghomara Berber Christians. * Pray that God will give these new converts boldness to share Christ with their own people. * Ask the Holy Spirit to soften the hearts of Ghomara Berbers toward Christians so that they will be receptive to the Gospel. * Ask the Lord to raise up strong local churches among the Ghomara Berbers. * Pray for Gospel messages to become available in audio format for this people group.View Berber, Ghomara in all countries. Location in Country: Tangier-Tetouan region: Chechaouen province, 60 km southeast of Tétouan, Rif Mountains coast.